I took a day-trip in early February with Wes Barton and Bryan Harrington to visit Thomas Fogarty Winery in the Santa Cruz Mountains. Bryan is the owner and winemaker at Harrington Wines in San Francisco (where I work part-time), and Wes is a wine blogger and an amazing source of information on the wines and vineyards of the Santa Cruz Mountains. Wes had arranged for us to do some tasting with Thomas Fogarty winemaker Nathan Kandler. All of us were already familiar with the wines of Thomas Fogarty – known in particular for their fine Pinot Noirs and Chardonnays, and I’ve always enjoyed their Gewürztraminer as well. But there were two areas of special interest for us on this occasion. One was that Wes is making a Syrah / Sangiovese blend – currently in barrel – sourced from Ascona Vineyard in the Santa Cruz Mountains, and these same two varieties from the same vineyard are also in barrel at the Thomas Fogarty facility. The other particular interest was in the tiny amount of Nebbiolo that the winery produces from a vineyard block on its estate property. 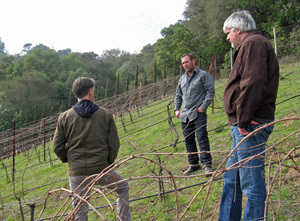 Harrington Wines has been making Nebbiolo sourced from the Westside of Paso Robles since 2008, so we were interested in checking out what Thomas Fogarty is doing with that variety in the Santa Cruz Mountains. On a cool but pleasant morning, I met Bryan in San Francisco and we drove from there to Thomas Fogarty Winery, high on a ridge along Skyline Boulevard in the northern part of the Santa Cruz Mountains AVA. Wes was waiting for us when we arrived at the parking area, and we walked from there up the hill to the winery building, atop one of the knolls on the property. As we reached the building, we found Nathan talking with someone just outside, and he introduced us to Tommy Fogarty, the son of winery founder Dr. Thomas Fogarty. Tommy is an integral part of the winery team, and he was able to join us for part of our visit that day. Thomas Fogarty 2012 Pinot Noir, Ascona Vineyard, Santa Cruz Mountains. Early pick, from 115, Swan, and Pommard clones. Medium color, with intense higher-toned cherry fruit and savory aromas, plus touches of fresh herbs and earth. Lively mouthfeel with milder tannins. Thomas Fogarty 2012 Pinot Noir, Ascona Vineyard, Santa Cruz Mountains. Later pick, from Martini clone. Medium color, this was less fruit-forward with more earth and spice on the nose, with a brighter mouthfeel and slightly bigger tannins on the finish. Thomas Fogarty 2012 Pinot Noir, Muns Vineyard, Santa Cruz Mountains. From 667 clone. Medium-light color, with a darker fruit profile along with herbs and a touch of pepper. Medium-bodied with good acidity and a chalky texture, quite distinctive. Thomas Fogarty 2012 Pinot Noir, Muns Vineyard, Santa Cruz Mountains. From 777 clone. Slightly darker color, showing plummy fruit and earth aromas. Similar mouthfeel to the 667 but with more structure. Thomas Fogarty 2012 Pinot Noir, Kent Berry Vineyard, Santa Cruz Mountains. About 15-year old own-rooted vines, unknown clone. Medium-light color, raspberry, tea leaf, and some spice on the nose. Medium weight on the palate and lively, with moderate tannins and a long finish, nice. Thomas Fogarty 2012 Pinot Noir, Biagini Vineyard, Santa Cruz Mountains. About 14-year old vines, Mt. Eden clone. Medium color, this had more floral character, plus riper red fruits and a touch of baking spice. Richer on the palate than the earlier samples. Thomas Fogarty 2012 Pinot Noir, Hicks Vineyard, Santa Cruz Mountains. From 115 clone. Medium-light color, with more complex aromatics with a slightly stemmy herbal note, flowers, earth, spice, and red fruits. Bright and lively on the palate with fairly mild tannins, very pleasant. Thomas Fogarty 2012 Pinot Noir, “press wine blend,” Santa Cruz Mountains. Without Chardonnay lees. Medium color, with some funk that quickly blew off, revealing black cherry, spice, and tea leaf notes. More texture and body than most of the earlier samples, with grippier tannins on the finish. Should be a good component in an overall blend. Thomas Fogarty 2012 Pinot Noir, “press wine blend,” Santa Cruz Mountains. Added to Chardonnay lees. Similar character to the previous wine but without the initial funk and with an added stone fruit component. Broad mouthfeel with milder tannins than the previous wine. Gollnick 2012 Pinot Noir, Gollnick Vineyard, Santa Cruz Mountains. From Dave Gollnick’s vineyard, made with 50% whole-cluster fermentation. Medium-dark color, displaying upfront black cherry and plum fruit and much stronger vanilla/oak character than the earlier samples. Medium-full bodied with the oak component continuing on the grippier tannic finish. Pascale 2012 Pinot Noir,Pescadero Creek Vineyard,Santa Cruz Mountains. All Dijon clones, 100% whole-cluster fermentation. Medium-dark color, with moderately stemmy/herbal notes along with intense dark berry fruit and touches of flowers and spice. Big and structured on the palate with chewy tannins. Thomas Fogarty 2012 Nebbiolo, Estate, Santa Cruz Mountains. Medium-light color, this featured pretty floral aromatics along with cherry and herb notes. Medium-light bodied with a bright mouthfeel and big but fine tannins on the finish. Certainly needing much more time, but off to a promising start. Thomas Fogarty 2012 Cabernet Franc, Ascona Vineyard, Santa Cruz Mountains. Medium-dark color, with herbal plum, earth, and some spice on the nose. Moderately rich on the palate, with medium-big tannins. Michael Martella 2012 Sangiovese, Ascona Vineyard, Santa Cruz Mountains. Medium color, very bright cherry fruit, spice, and a touch of tea leaf. Zippy acidity in the mouth, with a juicy finish. Michael Martella 2012 Syrah, Ascona Vineyard, Santa Cruz Mountains. Medium color, showing red fruits, a savory note, and a touches of spice and pepper on the nose. Lively mouthfeel with moderate tannins, nice. Precedent 2012 Zinfandel, Evangelho Vineyard, Contra Costa County. Field blend including some Mataro, Carignane, and a tiny amount of Palomino and Muscat. Medium color, this displayed beautiful intense aromatics of fresh raspberry and boysenberry, with hints of flowers, earth, and spice. Medium-bodied and lively, with moderately chewy tannins on the finish. This is already a standout. Precedent 2012 Riesling, Cienega Valley. Light color, this had bright floral aromas along with stone fruits and a herbal note. Medium weight in the mouth with good acidity and a fresh, clean finish. Needs more time to develop but showing good potential. Thomas Fogarty 2012 Pinot Noir, Razorback Vineyard, Estate, Santa Cruz Mountains. Early pick. Medium-light color, with floral and dark berry fruit on the nose along with a touch of dried herbs. Medium-bodied with moderate tannins. Thomas Fogarty 2012 Pinot Noir, Razorback Vineyard, Estate, Santa Cruz Mountains. Later pick. Medium-light color, showing brighter red fruit aromas along with a bigger spice component. More structured on the palate with grippier tannins. Thomas Fogarty 2012 Pinot Noir, Will’s Vineyard, Gist Ranch, Estate, Santa Cruz Mountains. Swan clone. Vibrant color, with intense strawberry and herb aromas plus hints of flowers. Very lively acidity in the mouth and not very tannic, this shows how nice Swan clone Pinot can be from the right site. Thomas Fogarty 2012 Pinot Noir, Will’s Vineyard, Gist Ranch, Estate, Santa Cruz Mountains. Rochioli selection. Slightly darker color, this featured strawberry and cherry fruit, spice, and earth. Bigger and more structured with more noticeable tannins. Thomas Fogarty 2012 Pinot Noir, Will’s Vineyard, Gist Ranch, Estate, Santa Cruz Mountains. Mt. Eden clone. Medium color, displaying floral notes along with deeper strawberry fruit, earth, and tea leaf. Medium weight on the palate, with a moderately tannic finish, showing good complexity already. Thomas Fogarty 2012 Pinot Noir, Rapley Trail Vineyard, Estate, Santa Cruz Mountains. From S Block, last pick. Medium-light color, plummy fruit plus spice and earth on the nose. Medium-light bodied, with moderate tannins. Thomas Fogarty 2012 Pinot Noir, Rapley Trail Vineyard, Estate, Santa Cruz Mountains. From H Block, fourth pick. Slightly darker color, with more intense red fruit and earth aromas. More body and firmer tannins than the S block sample. Thomas Fogarty 2012 Pinot Noir, Rapley Trail Vineyard, Estate, Santa Cruz Mountains. From T Block, third pick. Medium color, this was less fruit forward, with earth, tea leaf, and minerals, along with strawberry and rhubarb. More structured on the palate, with chalky tannins. A distinctive, minerally wine. Thomas Fogarty 2012 Pinot Noir, Rapley Trail Vineyard, Estate, Santa Cruz Mountains. From M Block, second pick. Medium color, featuring a darker fruit profile, along with a bigger earth component and some spice and vanilla/oak. A minerally note in the mouth with a more tannic finish. Thomas Fogarty 2012 Pinot Noir, Rapley Trail Vineyard, Estate, Santa Cruz Mountains. From B Block (Henry Ayrton's Block), first pick. Medium color, this had plum and black cherry fruit, earth, spice, and a forest floor element. Lively texture with more refined tannins and a long finish. This could easily be bottled on its own, quite good already. Thomas Fogarty 2010 Pinot Noir, Rapley Trail Vineyard, Estate, Santa Cruz Mountains. This included fruit from all five blocks of the vineyard, aged in 40% new oak. Medium-light color, featuring pretty floral aromas, red fruits, earth, with a savory note and touches of tea leaf and vanilla/oak. Medium-bodied with tingly acidity and moderate tannins, very nice. Thomas Fogarty 2010 Pinot Noir, Santa Cruz Mountains. Sourced from seven vineyards, including 34% from the estate vineyard. Medium-light color, with more upfront ripe red fruits plus some dried herbs and spicy oak. Tasty, though a bit simpler and less structured than the Rapley Trail bottling, with a smoother finish. Thomas Fogarty 2007 Merlot, Santa Cruz Mountains. 99% Merlot, 1% Cabernet Sauvignon, sourced from 95% Gist Ranch estate fruit, aged for 22 months in 40% new oak. Medium purple color, showing black cherry and darker fruit, herb, olive, and a dash of sweet oak on the nose. Medium-full bodied with fairly grippy tannins. Thomas Fogarty 2007 Syrah, Fat Buck Ridge Vineyard, Estate, Santa Cruz Mountains. From the Gist Ranch estate site, fermented with about 40% whole clusters, aged for 16 months in 20% new oak. Medium-dark color, this displayed ripe raspberry, earth, spice, and chocolate aromas. Fairly rich on the palate with a moderately tannic finish. Thomas Fogarty 2002 Port, California. 77% Tinta Cão, 23% Touriga Nacional from Hargan Vineyard in Amador County, made in a LBV (late bottled vintage) style, unfiltered. Medium color, with ripe plum, brown sugar and caramel, spice, chocolate, and a slightly earthy note. Big and full-bodied, with a long finish and refined tannins. Thomas Fogarty 2004 Late Harvest Gewürztraminer, Monterey. Sourced from Scheid Vineyard in Salinas Valley, whole-cluster pressed and cold-fermented in stainless steel, aged 22 months in neutral oak, 11.9% alcohol, 15% residual sugar. Medium gold color, aromas of ripe stone fruit and lychee, flowers, honey, and spice. Rich mouthfeel but with fairly good balancing acidity and a long finish, nice. I should provide some background on the winery before proceeding. Dr. Thomas Fogarty is a famed surgeon and the inventor of the embolectomy catheter, a small balloon-like device that he developed in the 1960s as a less invasive and more effective method to remove blood clots from arteries. Over the years, he has patented over sixty other medical inventions as well. 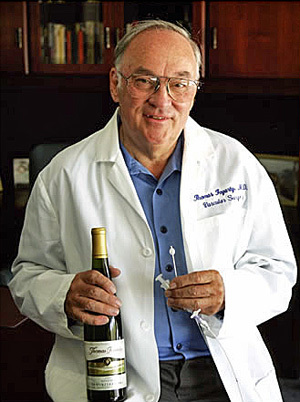 His first exposure to the wine business was in 1969, when he was teaching surgery at Stanford University and helped a colleague who had a small vineyard and winery. His interest in wine grew from there, and he purchased a 325-acre property in the mountains above the town of Woodside in the early 1970s. The first few acres of Chardonnay and Pinot Noir vines were planted in 1978, some of the oldest commercial winegrape plantings in that part of the Santa Cruz Mountains, and Thomas Fogarty Winery was established in 1981. Michael Martella, who studied enology at California State University in Fresno, has been in charge of the Thomas Fogarty winemaking and viticulture from the beginning, but he’s stepped back a bit as Nathan has recently been named the winemaker there – Nathan noted that Michael is now something of a winemaker emeritus. Michael also has his own label called Michael Martella Wines. Nathan first joined the Thomas Fogarty winemaking team in 2004. He grew up in Michigan, and studied political science at the University of Michigan. But a short stint working as a bartender got him interested in wine, and Nathan moved to California. He worked for a few Sonoma County wineries while studying viticulture at Santa Rosa Junior College, then earned a degree in enology at CSU Fresno. His first winery position after that was at Testarossa Winery in Los Gatos, and he also spent time at Torbreck Wines in the Barossa Valley of Australia before joining Thomas Fogarty. Michael directed the planting of nearly all of the Thomas Fogarty vineyards over the years. There are now 25 acres of vines at the main estate property, plus another 15 acres at a second estate vineyard called Gist Ranch, about 17 miles south of the winery site. Most of the early Pinot Noir plantings were with Martini clone cuttings obtained from Louis Martini's Winery Lake Vineyard in Carneros and from David Bruce Winery along Bear Creek Road in the Santa Cruz Mountains. There are a number of separate small vineyard blocks throughout both the main property and Gist Ranch. The main estate site is at around 2,000-foot elevation, with a variety of soil types but mostly shallow loamy topsoil over sandstone, shale, and marine deposits. There are three Pinot Noir vineyards at the main estate – Windy Hill, Rapley Trail, and Razorback. Razorback is the newest and lowest-elevation of these – two acres were grafted over from Chardonnay to Pinot in 2006 with 115, 667, 777, and Swan clones. Windy Hill, immediately to the southwest of the winery, is in the process of being replanted, with the 2½ acres of old Martini clone vines being replaced with Calera, Swan, and Mt. Eden clone Pinot with denser spacing than before. The largest estate Pinot site is 5½-acre Rapley Trail – this vineyard consists entirely of the original Martini clone vines planted in 1981 on AxR#1 rootstock. The Gist Ranch vineyard is at a slightly higher elevation, about 2,300 feet, and is mostly a warmer-climate site. The first plantings at Gist Ranch were in 1999, with Chardonnay, Pinot Gris (now grafted to 828 clone Pinot), Syrah, Cabernet Sauvignon, Cabernet Franc, Merlot, and Malbec. Pinot Noir was planted at Gist Ranch in 2000 at the Will’s Vineyard site, on a steep hillside site with rocky sandstone soil. Swan, Rochioli, and Mt. Eden Pinot clones are planted there, although Nathan noted that the Rochioli selection vines might actually be Pommard. Michael also noted that the Gist Ranch Syrah may be grafted over to Nebbiolo this year. All of the estate vineyards are farmed sustainably, without the use of any herbicides or chemical fertilizers. Use of cover crops, compost, and compost tea treatments is increasing in the vineyard management. The new Windy Hill planting will be farmed organically but there are no plans for certification. Nathan led us downstairs to the main barrel room of the winery, and he started us right in on tasting a wide array of 2012 barrel samples. Most of the wines we tried were Pinot Noir, though there were a handful of other varieties as well. With one or two exceptions, Nathan selected older barrels for us to taste from so as to reduce the oak influence from these single-barrel samples. He told us that most of the barrels had been sulfured quite recently, but that didn’t detract from our tasting. Most of the first batch of barrels we tasted from were Pinots that will go into the Thomas Fogarty Santa Cruz Mountains appellation bottling. This bottling includes estate fruit plus fruit from a number of other vineyards throughout the Santa Cruz Mountains AVA. Nathan said that the winery brought in about 80 tons of Pinot Noir last year, most of which will go into the appellation bottling. The best of the estate-grown fruit goes into vineyard-designated Pinot bottlings. It’s always fun to barrel-taste wines, but of course all of these 2012 samples were very young, only in barrel for a few months, and most of the wines we tasted will be components in larger blends. Still, it was quite interesting to go through so many barrel samples with Nathan – 27 of them in all! – and the vineyard and clonal distinctions were often quite clear. First up were two samples of Pinot Noir from Ascona Vineyard. 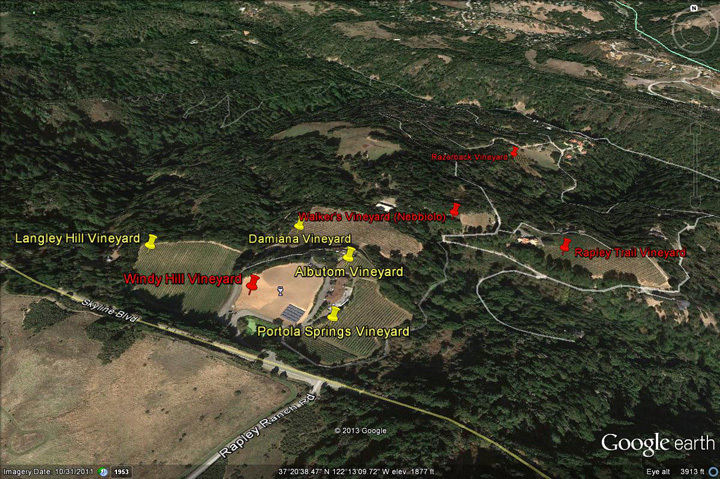 The vineyard is at around 2,400-foot elevation just off of Skyline Boulevard and not far from Thomas Fogarty’s Gist Ranch estate vineyards. Nathan told us that it has loamy topsoil above sandstone. We tasted an earlier pick of the Pinot there, which included 115, Swan, and Pommard clones, grafted in 2011, and followed that with a later pick of Martini clone Pinot. The vineyard is also planted to Sauvignon Blanc, Sangiovese, Syrah, Cabernet Sauvignon, and Cabernet Franc. 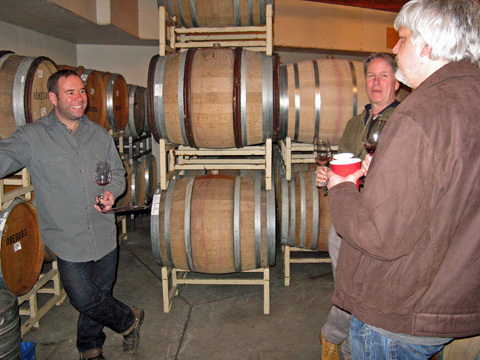 As we tasted, Nathan told us about the typical Pinot Noir winemaking at Thomas Fogarty. A number of factors influence when to pick fruit, including pH, brix, vine health, cluster and berry appearance, and of course the weather forecast. But Nathan noted that the brix for the Pinot fruit usually winds up being around 23. Most Pinots are fermented with approximately 25% whole clusters, though some get more, up to 100% in a few cases. Cold-soak lasts from three to seven days, with total maceration time lasting from 14 to 21 days. Fermentation with native yeast takes place in smaller open-top containers, many of them in tall “macro 48” bins and others in two- and three-ton fermenters. The wines are aged for ten months or more in French oak. Nathan noted that after experimenting with a variety of different coopers, the Pinots and Chardonnays are now aged entirely in Sirugue barrels. He feels these barrels allow the vineyard character to come through in the wines and do not contribute as much vanilla and toast as with some other coopers. The Santa Cruz Mountains appellation Pinot blend gets about 20% new oak, while vineyard-designate Pinots get more. The 2011 single-vineyard designate Pinots will be bottled in April. Our next two barrel samples were from Muns Vineyard, which also provides Pinot fruit to several other wineries, although 2012 was the first year that Thomas Fogarty got fruit from there. 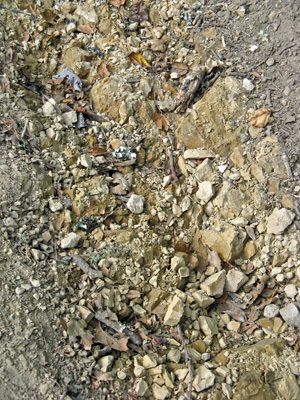 The hillside vineyard has fractured shale soil and is situated at about 2,600-foot elevation. The first barrel we tasted from was from 667 clone, and the wine was still going through malolactic fermentation. The second sample was 777 clone, from the same part of the vineyard. Next was a sample from Kent Berry Vineyard, on the east side of Highway 17 not far from Loma Prieta Mountain. The vines are about 15 years old and own-rooted, and Nathan said that the clone is not known. A sample from Biagini Vineyard was next. Located in the Corralitos area, the vineyard is farmed by noted Santa Cruz Mountains viticulturist Prudy Foxx – she farms or manages nearly all of the Corralitos-area vineyards that Thomas Fogarty sources fruit from. The Biagini vines were planted in 1998, and include 113, 114, 115 and 667 clones as well as the Mt. Eden clone that was in the barrel we tasted. Nathan noted that the Mt. Eden vines there may be from original cuttings from Mt. Eden Vineyard rather than the more common UC Davis 37 clone that was isolated from the vineyard. One final sample was from Hicks Family Vineyard, off of Pleasant Valley Road near Corralitos. All of the Pinot samples we had tasted were from single vineyard sources that will go into the Santa Cruz Mountains appellation bottling, and they were all from free-run wine. Nathan noted that they drain the free run wine from the fermentation tanks overnight, so they are able to obtain a high percentage of free run that then goes into these barrels. After the remainder of the Pinot is pressed, the press wine from all of the vineyards is consolidated into separate barrels at Thomas Fogarty, and we tasted two barrels of that next. Nathan told us that he and Michael had experimented with adding the press wine to some Chardonnay barrels that had been racked, with the Chardonnay lees left in the barrels. We first tasted from a barrel without the Chardonnay lees and then from another barrel that had the press wine added to the lees that remained in that barrel. The difference was striking, with aromatics from the lees barrel veering toward stone fruit – blindfolded, it’s not impossible to think this could be mistaken for a white wine. We continued with two 2012 Pinot barrel samples for different wine projects before moving on to some other varieties. We tasted a Pinot being made for Dave Gollnick from his vineyard off of Alpine Road – he’s still working on the final name of his wine label. Rex Geitner of Clos de la Tech (their winery is just down the hill to the west of Thomas Fogarty) is farming the Gollnick Vineyard, and Nathan noted that they harvested just four barrels of wine from the eight-acre site. The wine was fermented by native yeast with 50% whole clusters and is being aged in 100% new French oak. We then tasted a Pinot for a project that Nathan is now consulting for, for a small label called Pascale. Sourced from Pescadero Creek Vineyard, planted in the early 2000s above the coastal town of Pescadero, Nathan noted that this is probably the most northerly coastal vineyard in the Santa Cruz Mountains AVA. Also farmed by Rex Geitner, the vines are all Dijon clone, and the wine was 100% whole-cluster fermented with native yeast and aged in new François Frères Bertranges oak. Nathan also noted that this vineyard is in a challenging site, yielding only 0.6 tons from two acres in 2012. Taking a break from the Pinots, we tasted the Thomas Fogarty Nebbiolo, from a tiny vineyard block at the estate property. Thomas Fogarty produced all of one barrel of this in 2012…and that was from a particularly good-sized crop! The Nebbiolo fruit was entirely destemmed, and the wine was quite nice, with pretty floral aromatics. Nathan next led us over to another portion of the barrel room, where we tasted a Cabernet Franc, a Sangiovese, and then a Syrah from Ascona Vineyard – the last two for Michael Martella Wines – all quite interesting, with bright fruit and good acidity. We then tasted two wines that Nathan is making for his own Precedent label. He began the label in 2006 with a Pinot Noir from Chileno Valley Vineyard in Marin and followed that the next year with a Syrah from Dry Stack Vineyard in Bennett Valley, then made a dry Chenin Blanc from Ventana Vineyard in Arroyo Seco in 2010. That year also marked his first wine from Evangelho Vineyard in Contra Costa County. Located near Antioch, this vineyard was planted in 1890 on deep, sandy soil. The own-rooted vines are head-trained and dry-farmed, and they are a field blend of mostly Zinfandel, along with small amounts of Mataro and Carignane, as well as white grapes Palomino and Muscat. Nathan told us that the acidity the grapes hold is remarkable – the sugars can be 25 brix with a pH of 3.0. Everything is co-fermented with native yeast and aged in older oak. We went on to a dry Riesling from 60-year old vines in San Benito County’s Cienega Valley, not far from Calera’s winery and vineyards. Nathan barrel-fermented this in neutral oak. At this point, we were ready for a break from barrel-tasting. Tommy had to meet with another group visiting the winery, but the rest of us hopped into Nathan’s car and rode down the hill a short distance. There we got out and walked a few hundred feet to Walker’s Vineyard, Thomas Fogarty’s Nebbiolo block. Only about ¼-acre in size, this was planted about 1999 in sandstone soil, on a southwest-facing slope. Nathan told us that the original planting was all Nebbiolo Rosé clone but most of the block has since been grafted to a variety of clones, and these older vines are being dry-farmed. The first crop was in 2006. There are also a couple of rows at each end of the vineyard block that have been recently planted with 230 clone – Nathan told us that they planted this to try getting a full barrel’s worth of wine each year, as some vintages have only yielded a half-barrel. And he’s reported that in 2008, the entire crop from this tiny block was lost to hungry raccoons. For being over ten years old, the Nebbiolo vines looked thin and scraggly. 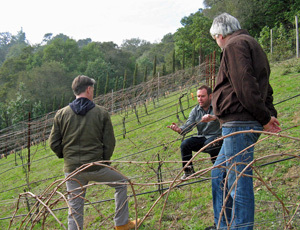 More than one Santa Cruz Mountains vintner has given up on Nebbiolo, a tough variety to grow in this area, but hopefully Thomas Fogarty will have success with the wine from their small planting – because it’s so scarce, it all goes to wine club members. Getting back into Nathan’s car, we headed to another barrel room, located not far from the main winery. Here we tasted Pinot Noir barrel samples from several of the Thomas Fogarty estate vineyards. We started with Pinot from Razorback Vineyard at the main estate property. This is a new vineyard-designate Pinot bottling for Thomas Fogarty – the first release will be from the 2011 vintage. The lower part of the vineyard was picked first and the upper part later – this vineyard is not picked by clone. We tasted barrel samples from both the earlier and later picks. Next we moved on to Will’s Vineyard at the Gist Ranch site, tasting samples from three separate Pinot clones planted there. The 2012 vintage will mark the first vineyard-designate Pinot Noir from Will’s. Our barrel tasting with Nathan concluded with Pinot from Rapley Trail Vineyard at the main estate. Because of the hillside location, the blocks ripen at different times – like the Razorback site, the lower block ripens first and the upper blocks later. We tasted samples from five blocks of Rapley Trail, from the last to first pick – and top to bottom of the slope – these were the S, H, T, M, and B Blocks. Wines from two of these blocks, M and B, have sometimes been bottled separately. Nathan noted that the B Block is being renamed “Henry Ayrton's Block” from the 2011 vintage forward, in honor of Tommy Fogarty’s son, who was born the same day that the block was picked in 2011. We all felt that the 2012 barrel sample from Henry Ayrton's Block was the most complete wine on its own, but together, all of the components should produce a very fine Rapley Trail bottling. The extensive barrel-tasting had taken longer than expected, and Nathan needed to take off, so he drove us back to the winery and Bryan, Wes, and I stopped in the tasting room there to try a few of the currently-available wines. The winery tasting room is open on Monday from noon-4pm and Wednesday-Sunday from 11-5 pm. In addition to various bottlings of Chardonnay and Pinot Noir, Thomas Fogarty Winery produces Gewürztraminer, Riesling, Pinot Gris, Barbera, Syrah, Cabernet Sauvignon, Cabernet Franc, Merlot, Meritage, plus small bottlings of dessert wines, Nebbiolo, sparkling wine, and occasional small bottlings of other wines. Total annual production is around 12,000 cases. The winery is also known for hosting events, including weddings, corporate, family, and other events. The panoramic views of the Bay Area on a clear day are spectacular. We couldn’t resist tasting the finished 2010 bottlings of both the Santa Cruz Mountains appellation Pinot Noir as well as the 2010 Rapley Trail Pinot at the tasting room. We also tried a Merlot, Syrah, and two dessert wines. It was mid-afternoon by the time Bryan, Wes, and I left Thomas Fogarty Winery, and we were all hungry. We drove back north for a few miles and stopped in Sky Londa, the tiny community nestled among the tall trees at the junction of Skyline Boulevard and Woodside Road. We ordered some tasty sandwiches at the deli inside the Skywood Trading Post and sat down outside. Sky Londa is a popular stop for motorcyclists on weekend rides, so we watched many of them come and go while we ate. We’d thought about making one more wine visit, but as it was already getting to be late afternoon we decided to call it a day and head home. We sampled a lot of wines during our visit with Nathan at Thomas Fogarty. Of course, all of the 2012 barrel samples still have a ways to go, but most of them showed a lot of promise toward assembling some very good wines. My favorites among the non-estate 2012 barrel samples included Pinot Noirs from the Muns Vineyard 667 clone, Kent Berry Vineyard, Hicks Vineyard 115 clone, and Pinot press wine without the Chardonnay lees, as well as the Michael Martella Ascona Vineyard Syrah and the Precedent Wines Zinfandel and Riesling. Among the estate vineyard 2012 barrel samples, I thought standouts included both the Swan and Mt. Eden clone Pinot Noir samples from Will’s Vineyard, the Rapley Trail T and B (Henry Ayrton's) Block Pinots, and the Nebbiolo. My top pick of the bottled wines was the 2010 Rapley Trail Pinot Noir, and I liked the regular Estate Pinot and the late-harvest Gewürztraminer too. Overall, we tasted some very good wines. 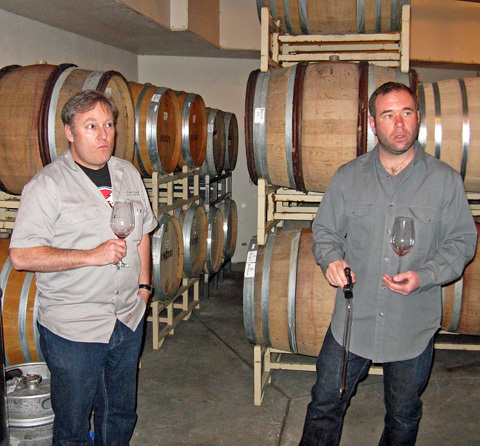 Tommy Fogarty and Nathan Kandler were great hosts during our visit to Thomas Fogarty Winery. It’s always fun tasting with a winemaker who is so excited about sharing samples of their wines – I think that Nathan would have continued with more barrel tasting for the rest of the afternoon if he hadn’t had to leave when he did. Nathan noted that the winery has been working to better showcase the terroir of their vineyards, and based on the barrel samples we tasted, I think they’re heading in a good direction. Michael Martella has left some big shoes to fill as Thomas Fogarty’s winemaker, but Nathan looks to be more than capable of carrying on the tradition of producing fine wines there and perhaps carrying them to new heights.